I went record-shopping yesterday (January 11, 2014) at one of my favorite places on the planet, the Down Home Music Store on San Pablo Avenue in El Cerrito, California — details here. The only fault I’ve ever found with DHMS is that they are only open from Thursday through Sunday, so I have to plan my life accordingly. But I came home with a cardboard box of 78s, one 45, 10″ and 12″ lps. Total price: less than a hundred dollars for hours of fun and amazement. A brief list follows, just to encourage all of you who have such leanings to pay the lovely amiable folks at the DHMS a visit soon. Of course, the records I bought aren’t there in multiple copies, but they have an astonishing selection of new compact discs covering every kind of music I can think of, and some I haven’t even imagined. One 45 EP of the late-Forties West Coast Fletcher Henderson band with Vic Dickenson as prominent soloist. 12″ lps: a Queen-Disc Italian bootleg of Goodman 1938, all with Dave Tough; another copy of the Harry James 1937 Brunswicks on Tax; Edmond Hall’s PETITE FLEUR on United Artists; Eddie Barefield with Vic and Taft Jordan on UK RCA Victor’s SWING TODAY series; the New Hampshire Library of Traditional Jazz collection of 1949 airshots from the Savoy in Boston with Hall, Windhurst, and Vic; Wingy Manone’s late-Fifties Deccas as TRUMPET ON THE WING; TUTTI’S TRUMPETS on Buena Vista; Jimmy Rowles playing Ellington / Strayhorn on Columbia . . .
And the experience of buying records is so sweetly nostalgic for someone like myself who found great pleasure in stores like the DHMS. The results are more than “collecting,” “amassing,” and “having”; I learn something every time. For instance: the soundtrack to this post is the 1938 Goodman band, with glorious work from the Man Himself, Bud Freeman, Vernon Brown, Dave Tough, and Jess Stacy — but did you know that when DON’T BE THAT WAY was announced for a repeat performance on Camel Caravan, it was credited as being “Professor Goodman’s own tune.” I feel very sorry for Edgar Sampson and hope that the royalty checks made up for the erasure. 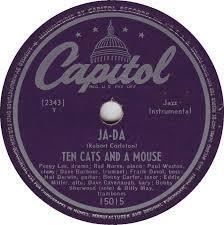 Some of the records had identifying labels on them; many were well-played and well-loved. I thank you, dear Collectors with Taste whose possessions I am now enjoying. What gifts you pass on! And as far as record-buying, I know that someone could read this as another example of excessive materialistic self-gratification, when there are people on the planet so much less fortunate. I know I do not need more music, but I retreat into KING LEAR mode and mutter, “O, reason not the need!” Records are less expensive than bringing a hundred knights with me wherever I go. So, if you can get down to the Down Home Music Store, I commend it to you. If you can’t, I understand, so play some music for yourself today. It lifts the heart.